Skiers hit Bear Valley's cross-country resort for its trails and warming hut. “Don’t think” and “remember to breathe.” Though they sound like meditation guidelines, the activity in this case is cross-country ski lessons. I’m spending the weekend at Royal Gorge,Northern California’s largest cross-country ski resort, learning to use my new nordic boards and, as a bonus, getting a refresher course on how to relax, breathe, and live in the present. What the self-actualization stuff has to do with cross-country skiing is this: It’s a peaceful, meditative sport. I had this revelation after spending many years alpine skiing, blazing downhills kamikaze-style and impatiently standing in line between adrenaline rushes. As the lift lines got longer and tickets more expensive, I started to consider replacing my downhill skis with skinny ones. I’m not alone: The transition from alpine to cross-country is not uncommon, says Bill Sterling, cross-country skiing representative for the Salomon sports-equipment company and a nordic ski-team coach. Indeed, the first thing that strikes me when I step into my cross-country skis is how light and agile I feel with them on. I even feel stable enough to jump up and down with my skis on, which is exactly what our Australian instructor, John Stoddart, has us do on our first morning. With his Paul Hogan-like accent and graceful manner, he makes it seem easy. But each time I focus on using my poles to propel me, my arms and legs get out of sync. When Stoddart brings out his videocamera, I try even harder – and end up even more befuddled. Lightening up isn’t easy when you’re falling down, so snowplowing is one of the first things Stoddart teaches us. Even though the snowplow is familiar to me from my downhill days, it’s different on skinny skis. As my husband puts it, “You feel like a newborn reindeer on ice.” Just about everyone in our group falls at least once going downhill. But Stoddart turns our mishaps into lessons: If you need to pass a fallen skier, simply step out of one track and into another. I begin to find metaphors in everything Stoddart says: If you don’t like where you are, change tracks; lookahead to where you want to go; learn to stop so you won’t feel out of control; don’t think; breathe. I know I probably look silly in my forward-thrust position, my face barely concealing the elation of finally getting it right. But why hide it? I grin as I glide past him, thrilled to be striding, skiing, breathing, enjoying every moment. Though few resorts offer as comprehensive a beginners’ program as Royal Gorge, mountain retreats throughout the West offer nordic ski lessons. 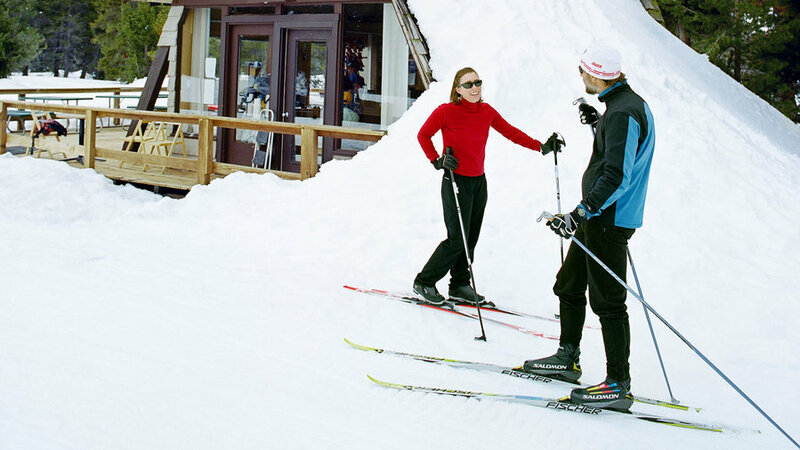 The Cross Country Ski Areas Association (www.xcski.org) provides listings of member resorts by state. Here are a few of our favorites. Lone Mountain Ranch. Weeklong packages (including airport transportation, meals, lodging, group ski clinics, trail passes, and educational programs) from $1,896 for the first person, from $1,148 for the second person, and from $746 for each additional person. Private or group ski lessons available for an additional fee. www.lmranch.com or (800)514-4644. Royal Gorge. Two-day packages (including meals, lodging, ski instruction, and trail passes) $169-$179 per person per day. www.royalgorge.comor (530) 426-3871. Montecito-Sequoia Resort. Packages (including meals, lodging, and trail passes) from $105 per person per day. Ski instruction offered for an additional fee. www.mslodge.com or (800)227-9900. Sun Mountain Lodge. Rooms from $140; or three-day ski packages (including breakfast, dinner, lodging, and trail pass) from $393. Group nordic ski lessons (offered daily) $20 per person.www.sunmountainlodge.com,(800) 572-0493, or (509) 996-2211.